Boeing has opened a new center at its campus in Everett, WA, USA. 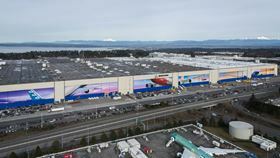 Boeing invested more than $1 billion in the Composite Wing Center (CWC) for construction and outfitting of the new building. The facility will manufacture the world’s largest composite wings for the 777X, the company's newest commercial jetliner and sustain thousands of local jobs for decades to come, the company said. The CWC is more than 27 acres under one roof – the equivalent to 25 football fields. It will contain three of the world’s largest autoclaves, each big enough to fit two 737 fuselages inside. This story is reprinted from material from Boeing, with editorial changes made by Materials Today. The views expressed in this article do not necessarily represent those of Elsevier. A 3D printed trim-and-drill tool, developed by researchers at ORNL,has received the title of largest solid 3D printed item by Guinness World Records.